When I first saw Piff the Magic Dragon on America’s Got Talent season 10 I was instantly drawn by the humor and fun the performer brings to the stage. I was engaged by the silly costume, the awe-inspiring sleight of hand and magic and the cuteness of his sidekick Mr. Piffles. The duo, if you will, really won my heart over and so when I heard about their new show in Las Vegas, I knew I had to make the effort to see them in real life. I have always had a sweet spot in my heart for magic and good-fun, not to mention cute animals, so this seemed like the perfect opportunity. Arguably, it is hard to match the unique quality of a magician in a dragon costume. While there is plenty to see in Las Vegas, Piff shows himself to be truly unique, a shining green star in a galaxy of 'regular’ performers. 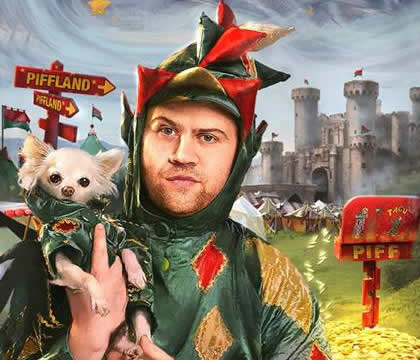 Of course many stay for the quality of comedy, stirring magic and adorable Mr. Piffles, but the true initial visual draw to Piff the Magic Dragon’s show is that he is so unique in his own character. I’m not quite sure where else you could find a magic show featuring a reality television success in a green dragon costume doing magic. I remember one of my favorite moments from his appearance on America’s Got Talent was his trick using a piece of toast. Obviously, the toast and the bread was really just the doorway into the magic trick as he then mystifies the audience with swift slight of hand. Piff’s magic is electrifying to watch, his mastery of unifying slight of hand with a slightly sarcastic sense of humor and with awe-inspiring physical magic is a visual treat. The way he can interact with different objects as simple and relatable as a toaster and a tv screen really brings the audience into the magical world Piff creates. In many respects, many people know what to expect when they go to see a magic show. We all expect to see cool tricks, things we have never seen before or unbelievable stunts. However Piff’s unique style. Pff isn’t your typical comedian. Plenty of his tricks rely on pulling the wrong card or getting the trick wrong initially and then use the deliberate miss-step as an opportunity for a tongue-in-cheek joke or gag. He is so unique in his willingness to perform in a traditional sense while also employing physical comedy like eating foods on stage, walking on and off stage and of course, wearing his signature green, red and gold dragon costume. I couldn’t begin to describe to you how Piff performs his magic. There is so much finesse to the quality of his slight of hand that it is so easy just to get lost in the world of possibilities he creates. He is a true master of his craft and it is no mistake that he has been a runaway star from his stint on reality tv. Piff could go toe to toe with the greatest in magic today and come out on top. His magic is just that good! Your mind will be wrapped around trying to figure out how he completed his trick, made a card appear or disappear. Surely, as a good magician, he’d never reveal his secrets. When was the last time you have seen a magician pull the correct card out of a can of dog food. His critics both on and off of tv have praised Piff for his skills in magic, personality and stage-presence. Mr. Piffles is of course, Piff’s silent assistant. However Mr. Piffle’s furry assistant brings an adorable shift in stage presence. Without the cute and humorous silent quality of Mr. Piffles, Piff’s punchlines wouldn’t quite be the same. Even the jokes where Mr. Piffles is in possible trouble or turmoil, it is clear that Piff’s love for his small furry assistant keeps him from being harmed by the magician. The audience will feel so attached to the safety and well-being of Mr. Piffles that his presence will add humor and heart to the performance. While looking at the audience it is clear that Piff’s magic is understandable and easily enjoyed by people of all ages. Young children in the audience will be wowed by the magic Piff is capable of, making cards disappear, making cards appear in the burn marks on a piece of toast, reaching for cards through television screens. His comedy is sometimes a little bit more complicated so adults and the elderly alike will enjoy his clever play on words and usage of intelligent comedic devices will delight many. While Piff’s show carries the tagline that he and Mr. Piffles “don’t do children’s parties”, and while some of his jokes are maybe just a little crass from time to time, I don’t see any problem in bringing kids to enjoy the show too! Piff the Magic Dragon himself has said he has performed in Las Vegas numerous times over the years or rather “just near” the various famous casinos and hotels in the city. His comedy and magic really comes from a humble, sarcastic place that defies the expectations for what a magic act or show can really be. Going to Piff The Magic Dragon’s show isn’t like going to a typical high profile magic act. There is a way in which Piff’s magic feels humble and also relatable to many. His relatable sense of humor will have many, if not all, laughing in their seats. If you or a friend has an opportunity to see Piff The Magic Dragon live in Las Vegas, I beg you to go and see it. You’ll never want the show to end if you go and see Piff and Mr. Piffles, they are just that good.